A Steering Committee is consisted of nine (9) members elected or appointed from amongst the Chapter delegates. More information about the members of 2017 and 2016 Steering Committees can be found on our Chapters AC Steering Committee page. The list of current chapter representatives is available here. Read the Chapters Advisory Council Charter here. Spanish and French translation drafts are also available. 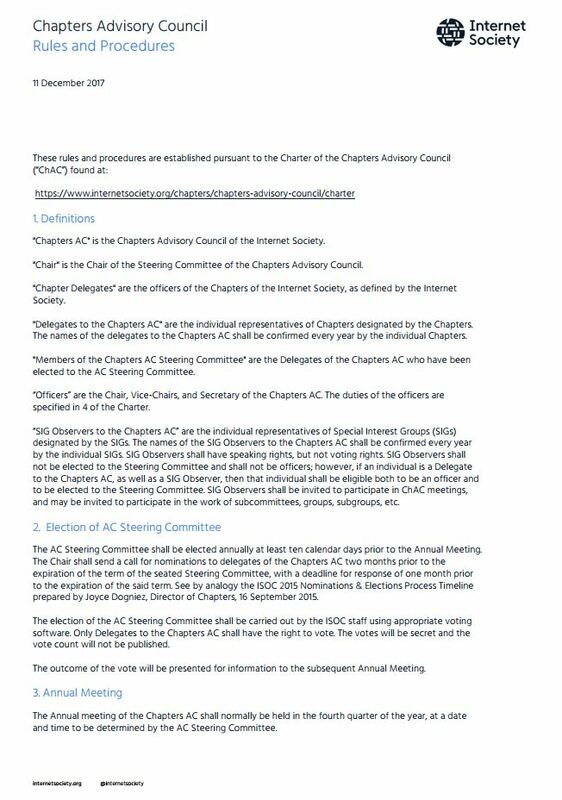 “Chapters AC” is the Chapters Advisory Council of the Internet Society. “Chair” is the Chair of the Steering Committee of the Chapters Advisory Council. “Chapter Delegates” are the officers of the Chapters of the Internet Society, as defined by the Internet Society. “Delegates to the Chapters AC” are the individual representatives of Chapters designated by the Chapters. The names of the delegates to the Chapters AC shall be confirmed every year by the individual Chapters. “Members of the Chapters AC Steering Committee” are the Delegates of the Chapters AC who have been elected to the AC Steering Committee. “SIG Observers to the Chapters AC” are the individual representatives of Special Interest Groups (SIGs) designated by the SIGs. The names of the SIG Observers to the Chapters AC shall be confirmed every year by the individual SIGs. SIG Observers shall have speaking rights, but not voting rights. SIG Observers shall not be elected to the Steering Committee and shall not be officers; however, if an individual is a Delegate to the Chapters AC, as well as a SIG Observer, then that individual shall be eligible both to be an officer and to be elected to the Steering Committee. SIG Observers shall be invited to participate in ChAC meetings, and may be invited to participate in the work of subcommittees, groups, subgroups, etc. The Chapters Advisory Council has submitted several proposals to the Board of Trustees. List of all recommendations with the responses from the Board can be found here.